I woke up extra early yesterday morning in hopes of nabbing a couple of foggy morning shots a la Kathleen, but my timing was all screwed up so I ended up venturing Blue Ridge Parkway to see if I could get a decent estimate on the autumn colors. My Color Report this week: There are plenty of colors up here, just not of the fall kind. There are blotches of reds and yellows on top of Grandfather Mountain and upon the drought stressed maple trees lining the streets of Boone, but we just ain't near there yet. Fall has to cook some more. 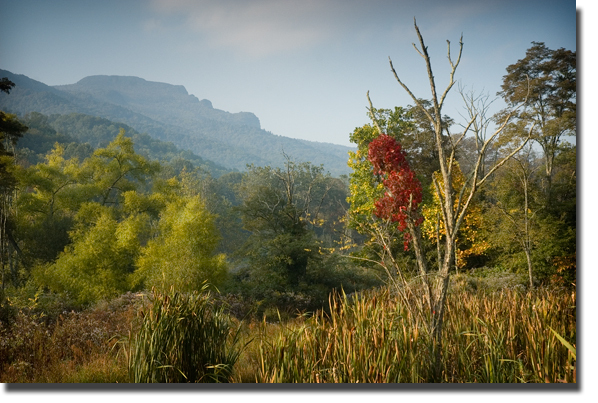 I did happen upon a striking view of the Grandfather Mountain profile. This shot was taken over a marshy area just beyond the parking lot of the Grandview Restaurant in Foscoe. Oh and besides savoring Kathleen's photos be sure to check out Mark's photos on Appalachian Treks. Mark wanders these hills of northwest North Carolina and Eastern Tennessee. And look! He's been to Valle Crucis and Grandfather Mountain.